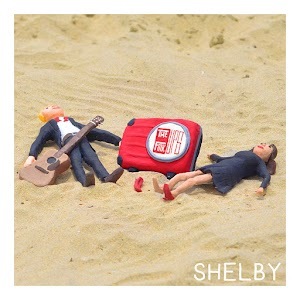 Whimsically simplistic, but none the less moving, The Folk Ups’ latest EP, Shelby, released last week, is an easy going listen. The Hong Kong based Duo excelling the most in their strikingly distinct vocal range. Ryan Harling with his deep Sinatra like baritone complimenting Jasmine Kelly’s pleasantly mellow voice, making for a surprisingly unique combination. The duo sticks to their guns with a familiar sonic mosaic of picked, strummed and bowed acoustic strings against a modest tambourine and bass drum percussion that offers a welcome break from the often over engineered popular music of this decade. Though at times the bass kick, which seems to be creatively cobbled together from a suitcase, is barely audible, the rest of the layers are crisp and well mixed. The church choir backing vocals in For Your Eyes Only are just one example of the impressively unique components that make up the EP’s three tunes. Worth mentioning too is their cohesive band image with inventive use of maps and clay figures in their album art, their logo that almost harkens back to traditional Chinese ink seals, and, lets just say the more than memorable play on words in the Duo’s name. If you’re looking for a moment’s reprieve amidst the stir of Hong Kong’s traffic, they’re definitely a group to watch in the coming months. The Folk Ups can be found on Spotify and Bandcamp.